This photograph of former minor league baseball players was taken in 1996 at a Kansas-Oklahoma-Missouri (KOM) League reunion organized by league historian John Hall. It includes reunion attendees who played for KOM League teams in Independence, Kansas. 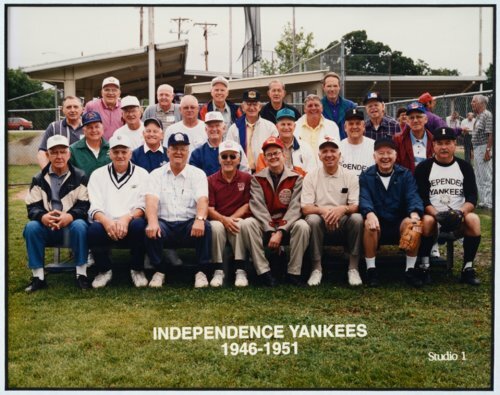 The caption printed on the photograph reads "Independence Yankees, 1946-1951." However, the Independence Yankees, an affiliate of the New York Yankees, played in the KOM League between 1947 and 1950; the Independence Browns played in the league in 1952. Individuals seated in the front row are (l to r): Charlie Weber, Keith Speck, Bob Newbill, Bob Signaigo, John Hall (league historian and reunion organizer), Jack Hasten, Kenny Bennett, and Paul Nichols. In the second row are (l to r): Bob Hamric, Al Billingsley, Lilburn Smith, Tom Gott, Ray Haley, and Harland Coffman. In the third row are (l to r): Al Long, Bill Bagwell, Jim Snyders, Stokes Dodson, Bob Loddeke, and Goldie Howard. In the back row are (l to r): Bob Wiesler, Charlie Popovich, Bunny Mick, Denis Jent, and Bob Mallon. Jim Snyders was the only former player photographed who played for the Independence Browns; all of the other former players were members of Independence Yankee teams. The photograph was taken at Jaycee Park in Pittsburg, Kansas during the reunion held between May 31 and June 2, 1996. Digital reproduction of the photograph was accomplished through a joint project sponsored by the Kansas Historical Society and the Shawnee County Baseball Hall of Fame.